and with lasting advertising value, an airline has captured the attention of passengers. As a general rule a card is defined as an airline card if an airline name, logo, or aircraft is imprinted on the box, back or face card, indicating it was issued by an airline company. There are also optional cards which include cards such as tourists and /or commercial souvenirs which may or may not be official airline issues. For many passengers, playing cards were also something they could take home as souvenirs of their flight experience. Indeed, playing cards have become one of the major collection categories of airline memorabilia, along with china and glassware, stickers, post cards and other items eagerly sought after at Collectible shows. Almost all of the airlines give out packs of Cards to their customers that request them. Mostly these are given free, but some of the Airlines have begun to sell their cards. More important than using playing cards to keep passengers occupied in-flight, airlines have long recognized their values in sales promotion. Card designs have always included the carrier’s name, logo, fleet, route structure or pictures of its pretty flight attendants for fun destinations. There are about 3100 cards decks of different designs that are known to have been issued by over 450 Airlines, dating back to the early days of commercial air travel. The oldest were probably, the ones issued by Imperial Airways, predecessor of British Airways, in the 1920’s, formed on March 31, 1924. Most of the major airlines have published many different editions through the years. Delta is probably the most noteworthy, having produced nearly eighty different decks. Pan Am came out with a twelve deck-set that included two sets of six different color photographs. United, Western, National and Ozark are among the several airlines that have published many different issues. 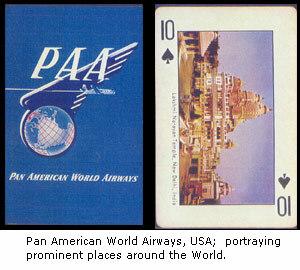 As commercial air travel became more common, airline playing card designs began to fall into four broad categories., featuring aircraft in the fleet: colorful pictures of destination cities: joint advertising with other products, and institutional designs which simply show a carrier’s name and logo, without special artwork. 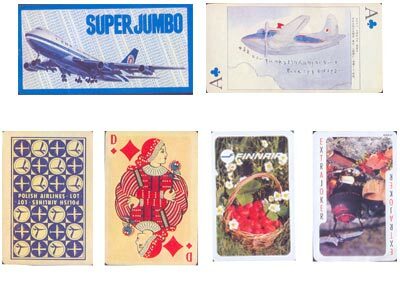 Airlines traditionally have been very proud of their craft: Many major airlines have issued playing cards showing pictures of them on Souvenir Playing Cards given to thousands of passengers. The major airlines that have consistently made their aircraft a part of card designs are TWA, Kuwait Airways and Saudia. A Collector series of 16 decks issued by TWA on the early Seventies shows the different types flown, from the Ford Tri-Motor in 1929 to the Lockheed L-1011 in 1972. Somewhat similar to the aircraft cards, in a marketing sense, are those that feature pictures of the Flight attendants (always females). Singapore Airlines produced a series of twelve decks of this design in the mid 1970’s. Other carriers have followed suit. These are China Airlines, Japan Air Service and Philippines Airlines, among others. Sterling Airways took the added step of combining an attractive flight attendant with a Boeing 727, but the plane somehow did not become the center of attention. Cards produced from travel posters represent another important design. Prospective passengers can thus be reminded of the airline’s destinations. Delta Airlines issued four series, totaling 66 different card designs during a twenty-year period ending in the late 1970’s. Use of Poster art has also been popular at Ozark, Pan Am, and Singapore airlines, plus several other carriers. Pan Am used a different approach in the 1950’s where faces of the cards were color scenes from the countries served by the carrier. These were the most expensive airline playing cards ever made during that period. The Ten of Spades had the color picture in this pack of Shri Lakshminarayan Temple of Delhi. Another type of card design used joint advertising copy for an airline and a company from another industry such as tobacco, liquor, entertainment, and even a football team. TWA issued a 15-deck series in the mid 1980’s in conjunction with some of the movies of that period. The deck that showed the poster from Star Trek IV also attracted considerable attention from collectors of the Star Trek the memorabilia. 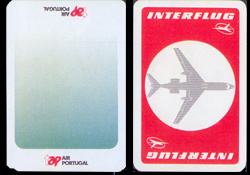 The most common type of card design is institutional in nature, when an airline chooses to show only its name and logo, with perhaps some slogan or illustration added. British Airways used an interesting approach for its institutional cards issued in mid-1980. Although the back design of the cards had only name and logo on it, the face of each card in it’s ‘History of Flight” deck shows a color drawing of different commercial aircraft used by that carrier and its predecessors; a handy miniature archive for the aviation historians. Institutional designs are often used to commemorate an airline’s anniversary. Rarely is less than a 20th Anniversary recognized in card form. Usually these are distributed for a relatively short period of time – a year or so and hence much more difficult to come by than with common ordinary designs. Pan Am Cards commemorating its 50 years of Trans-Atlantic services in 1989 are the most eagerly sought after in this category: only 500 decks were produced? 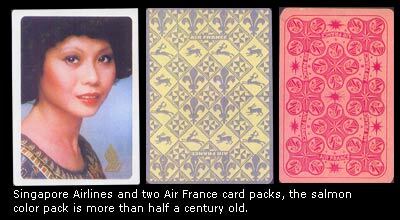 Other types of card designs that do not fall neatly into the broad categories described above are those of China Airlines, which issued a 12-deck series in 1992, with each example being a picture reproduction depicting birds that appeared on its Calendar: the birds being of special relevance in Chinese Culture. ‘Mint’ Decks, unused and still in original plastic wrapping are most sought after, though older examples often are no longer available in such condition. Flea markets do provide sometimes rare finds at a reasonable cost. Still the best source for those seriously interested in airline playing cards usually is fellow collectors, as well as friends, relatives who go or come from abroad and might be able to get airline packs of which they travel in. Air India Limited and Air Services of India Limited. 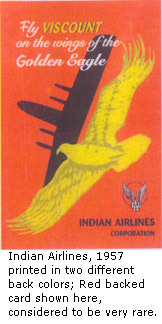 Only two packs of airline cards were issued by Indian Airlines in the year 1957 and these two are difficult to acquire. No playing cards were issued after these first issues by Indian Airlines. Air India was established on March 8, 1948 as Air India International by Air India Limited. 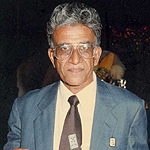 (Formerly TATA Airlines, founded in 1932). Operations commenced on June 8, 1948. Air India International became a wholly state owned Corporation on August 1, 1953 following the nationalization of domestic and International services. The name was abbreviated to Air India in 1962. There have been, however no new issues by Air India after the above two playing Cards and at least during the last six to eight years. Enclosed are pictures of all the playing cards issued by Air India that are with me i.e. 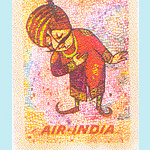 nine various Air India Playing Cards. Also during the last decade or less than that, some of the more private Air Line companies in India have brought out their playing cards. : 1: Modiluft and 2: Jet Airways. Jet Airways issued their first playing cards in the year 1995 with several diagonal wordings of Jet Airways and the logo of Jet Airways. Apart from Jet Airways, the Following world airlines have Jet as their First name, in the respective Airline. yellow colored roses all around with small horizontal tags showing Jet Airways in white on the black background followed by the airlines’ Logo and underneath on white background the message: ‘The joy of flying’. All the three Jet Airways Playing Cards are shown herewith, as also the picture of the special Box mentioned above. Unfortunately, I have not yet heard about the Playing Cards issued by Kingfisher Airlines of Vijay Mallaya Group, and also Sahara Airlines, and Deccan Airlines. It is found that the Indian Airlines mentioned above these days never give any of her Airline’s Playing cards in the flight; not only that, the Airline staff have not even heard about the Playing Cards issued by their airlines; especially, Jet Airways! I here below describe a few very interesting Airline Playing Cards in my collection, selected a few only, although I admit there are some wonderful Airline decks which are very difficult to acquire. In a small patience size, a nice pack of cards has been issued during the nineties. This pack shows 26 animals/birds on 26 hand drawn/printed cards and on the other 26 cards are shown the same animals, birds etc. in silhouette. 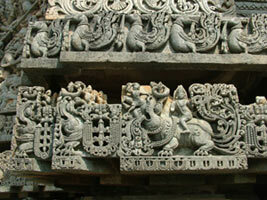 The names of all the 26 animals/birds are printed in Japanese and English under the same figure. All Nippon Airways and this pack is called Super Jumbo because of the size of the cards. Each face of the cards is hand drawn and description in Japanese underneath. A very difficult to get pack although not more than 15 years old. There are several playing cards decks called ‘Cards that talk’. Northwest Orient of USA have brought out such decks. Each of the cards on this deck gives translation into Japanese and other Oriental languages of a sentence written on the top in English along with a picture describing the situation in the centre. There is also another such pack of an extra large size. A Double-deck of extra large size playing cards in a leather box that I got from Mumbai Flea Market or Chor Bazar is that of the Polish Airline – Lot, with the writing and planes shown in small circles on the back of cards; with a blue color back and the other with a red color back. The faces on the court cards show nicely drawn/colored Polish historical figures with description of all the 12 cards on an extra card. 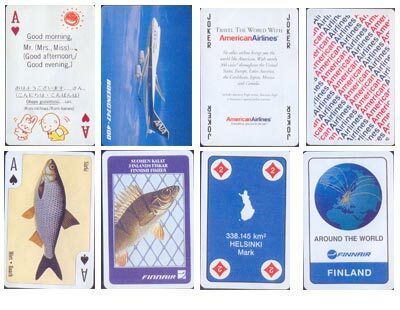 A somewhat recent Airline pack of cards issued by FINNAIR of Finland Airlines is a very unusual and interesting one and is known as an ‘Around the world’ pack. There are 27 countries of the world (Unfortunately, India is not one of them)! shown on the back as well as front sides of 54 cards including two jokers. Some of the countries shown are: United States, France, Belgium, Great Britain, Denmark, Japan and of course, Finland. The back of all the 54 cards has the white background and at the bottom is mentioned the country represented by that card in white on black background strip. Of the 54 cards, two belong to one country – in which one has the Flag of the country in color, and underneath the language of that country, population of that country and below that the population of the Capital of the country; all on the cream color background. The other card of the same country has the map of the same in white, and underneath the area of this country in Square Kilometers, and below that the Capital City’s name and lastly the name of the currency used in that country–all at the bottom, on blue background. Apart form the cards shown here, I have in my collection Playing Cards of many of the World Airline Companies, a few being, Lufthansa, Qantas, New Zealand Airlines, TWA, DELTA, South Africa, SABINA, (Belgium) China, Cathay Pacific, and many more. of every year. I am happy to say that from the very first issue of this reference guide, I have been able to help the compilers of this Catalogue (Mr. Trevor Davis of Australia and Mr. Fred Chan of USA) by sending the pictures and details of a few Airlines Decks which were new for the inclusion in the subsequent supplements. These playing cards were of Air India decks, Jet Airways, Modi Luft. Finland’s several of FINNAIR decks (Due to my close contacts with a Puzzle collector of Finland) Mauritius Airlines, ANA Japan, Malaysia Airlines, some Singapore Airlines and others! Since last four to five years, the Catalogue is being published with full color pictures of all airlines mentioned in the guide. Although the catalogue is high priced, it is a worthwhile buy for ardent Playing Cards Collectors of Airline Playing cards. Airline Playing cards are prized by many collectors. They are an easy group to identify and belong to Transportation Playing Cards (The other two being the Rail Road Playing Cards and Steamship Playing Cards), and form one more aspect of human culture that is represented on Playing Cards. But the charm of the playing cards extends to the average traveler which is why they will continue to be as popular well into the electronic age, as they were when they were first introduced many years back. All the cards shown are from the personal collection of the author.